1) Lord Sri Krsna is the Supreme Absolute Truth, the Supreme Personality of Godhead, the cause of all causes. The definition of God is given in this aphorism from the Vedas: "By Him and from Him is manifest this universe, and He controls its creation, sustenance, and annihilation." He is the mainstay of both this unlimited variegated cosmic manifestation and the immeasurable spiritual sky, the Vaikunthas. He is the eternally existing, transcendental Supreme Being with a spiritual form. The impersonal Brahman is but His bodily effulgence; He is the nondual Truth. The Supersoul (Paramatma) is His plenary expansion who resides in everyone's heart and pervades the entire creation as well. 2) The jivas, the living entities, are Lord Krsna's minute parts. Although the jiva is qualitatively nondifferent from the Lord, he is quantitatively different from Him, since the Lord is infinite and the jiva infinitesimal. The jiva is situated in the Lord's marginal potency, which, inconceivably, is simultaneously one with and different from the Lord. 3) The jivas the marginal energy of the Lord have the ability to reside eternally either in Vaikuntha or in this material world. A jiva falls down to material nescience because of countless sinful activities, and in these alien surroundings he goes up and down, traveling through all the planetary systems, from Lord Brahma's planet down to Patalaloka. In the material world the jiva experiences birth, disease, old age, and death and is forced to accept three types of suffering, namely, those miseries stemming from his own mind and body, those inflicted by other living entities, and those hurled at him by the demigods. 6) Those conditioned souls who identify with this illusory material nature and are proud of it, and who do not care to know about the Supreme Lord, are subjugated by the Lord's illusory potency, who is known variously as Maha Kali, Candi, and Durga, and who pierces them with her trident of the threefold miseries. These demoniac jivas are forced into slavery by the illusory potency Kali, or Mahamaya. The Bhagavad-gita, the essence of all the Vedic scriptures, was compiled for the deliverance of the conditioned souls. By studying the Gita carefully, a jiva takes shelter of the Supreme Lord's lotus feet and attains liberation from the merry-go-round of repeated suffering in the material world. 7) The conditioned jiva suffers from the material disease the miseries of birth, death, old age, and disease. When this suffering becomes unbearable, he looks for help. Those who are less intelligent embrace the path of impersonal liberation and undertake severe austerities to achieve their goal. More elevated than these salvationists are the devotees of the Lord, who realize that their eternal nature is to be His servants. They do not try to extinguish this nature but rather practice and preach the eternal process of devotion so they can enter the Lord's eternal spiritual abode. All living entities have a right to practice this eternal process of devotional service. 12) Foolish, demoniac rascals in the grip of the Lord's illusory energy loudly brag about their materialistic plans. 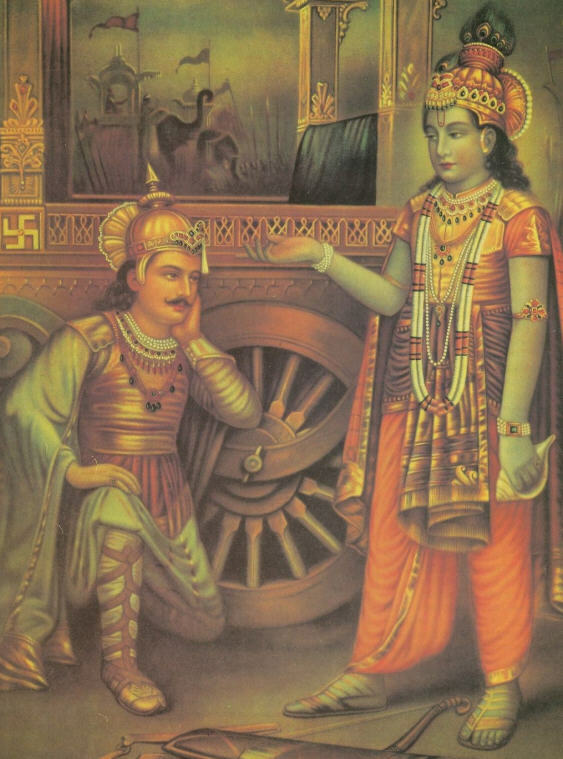 The Bhagavad-gita alone can penetrate their hard shell of ignorance and awaken them to the truth. 16) When monists are so attached to the formless, impersonal aspect of the Lord that they distinguish between Him and His transcendental body, their consciousness becomes contaminated by this blasphemy, and thus they are deprived of a place in the Lord's eternal abode. But if by some good fortune they come in touch with a pure devotee and hear from him with faith about the Lord's transcendental name, qualities, pastimes, and so on, then they will certainly be cleansed of their contamination and become inspired and attracted by the Lord's glorious character, and finally they will surrender to Him fully. Thus the Bhagavad-gita is such an instructive text that for those who want to enter into the eternal pastimes of the Supreme Lord, its unequivocal message teaches the first stages of surrender, and this surrender is absolutely essential for reaching the ultimate destination. It is to be understood that the pure devotees have successfully passed this test of surrender according to the tenets of the Bhagavad-gita.